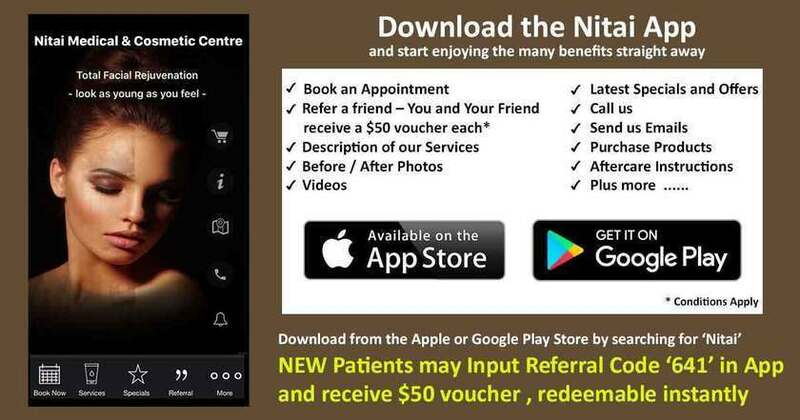 At Nitai Medical & Cosmetic Centre, we offer specialised medical services in the area of Cosmetic Medicine and Skin Care using state of the art Medical Grade equipment and procedures and protocols. Skin rejuvenation procedures are cosmetic treatments that improve the appearance and texture of skin. The treatments promote the regeneration of skin cells and leave you with healthier, younger-looking skin. Skin rejuvenation treatments can be performed anywhere on the body, but are most effective on the face, neck, chest and hands, since these areas are the most exposed to the elements. Our rejuvenating skin treatments can be used to reduce blemishes and improve the appearance of some skin conditions. What conditions can be treated with skin rejuvenation techniques? Wrinkles and fine lines occur both as a natural part of ageing, but also due to sun damage. To treat wrinkles and fine lines, we use an array of skin rejuvenation procedures to remove the top layer of dull-looking skin cells, increase production of essential ingredients for cell growth , and improve cellular regeneration to even out skin tone and texture for smoother, healthier-looking skin. Rosacea is a condition that can cause persistent or intermittent flushing, normally seen on the face with redness, inflammation and possibly swollen red bumps. To treat rosacea, we target the superficial blood vessels that are generating the redness. Our rosacea skin treatments can be very effective, but you will likely need more than one treatment depending on severity. Pigmentation caused by the sun, such as freckles and sunspots, tend to be light brown or tan spots that appear on the skin. We are able to reduce the prominence of or remove freckles by using a laser to absorb the pigmentation and remove it without harming the surrounding tissue. There are a number of different skin treatments available at our Melbourne clinic for effectively treating a variety of pigmentation conditions. Scarring is a mark left on the body from a wound that has healed completely, leaving fibrous tissue behind. At our Melbourne clinic, we use a number of different skin treatments to help reduce the prominence of scars, with the type of treatment given depending on the nature and severity of the scarring. Visible blood vessels,broken capillaries, port-wine stains and telangiectasia on the face can be treated with a vascular laser which gives long lasting results.Generalised redness responds best to skin care products and facial peels. While varicose veins and spider veins on the legs tends to respond the best to sclerotherapy. Do skin rejuvenation treatments hurt? What are the side-effects of skin rejuvenation procedures? The side-effects and recovery time of skin rejuvenation treatments varies depending on the type of treatment you receive. Stronger treatments can take up to two weeks to fully heal and may be swollen and itchy, whereas milder treatments are walk-in walk-out with no downtime. How many skin rejuvenation treatments will I need for best results? The number of skin treatments needed will vary depending on your skin concerns. Milder conditions may only need one or two treatments, however some skin conditions may require ongoing treatment. What should I do before my skin treatments? Your practitioner will advise you regarding any required preparation prior to your treatment at our Melbourne clinic. Most walk-in walk-out procedures do not require any prior planning, but more complicated treatments may require a consultation. What care is needed after my skin treatments? Avoiding the sun is the most important aftercare step for all skin treatments. UV rays can cause major problems for freshly-treated skin after a treatment, including causing pigmentation issues. Cleanse skin gently, apply a quality healing cream and sunscreen, and follow your medical practioners instructions. What type of lasers are used in skin rejuvenation procedures? There are several types of lasers used in skin rejuvenation treatments. The carbon dioxide (CO2) laser is fractionated and is best used for conditions that would benefit from the removal of damaged skin cells, such as scarring and uneven pigmentation. Treatments with the CO2 laser may take longer to heal. The erbium laser can be ablative or non-ablative and is commonly used for treating fine lines and age spots. The erbium laser tends to have a short recovery time. Are lasers the only option for skin rejuvenation? No. We have a vast array of skin rejuvenating procedure available at our Melbourne clinic, depending on your needs and skin type. One alternative to laser skin treatments is the chemical peel, which is coming back into vogue after many years on the backburner. Other options include wave- and light-based treatments, and dermal filler , anti-wrinkle injections and plasma regeneration therapy. What is the best skin treatment for me? The expert doctors at our Melbourne clinic will use their years of experience to determine the best skin treatments to get your skin looking and feeling its best.